The City of Graz - Historic Centre and Schloss Eggenberg is recognized due to the harmonious co-existence of typical buildings from different epochs and in different architectural styles. Being situated in a cultural borderland between Central Europe, Italy and the Balkan States, Graz absorbed various influences from the neighbouring regions and thus received its exceptional townscape. Today the old town consists of over 1000 buildings, their age ranging from Gothic to Contemporary. 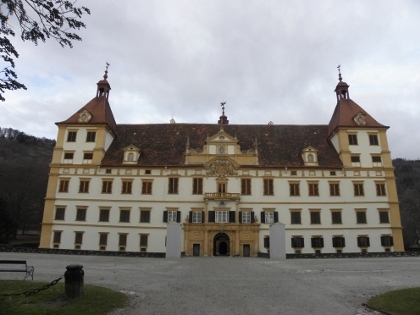 The baroque Eggenberg Castle and its gardens, at the western edge of the city, were added to the included area in 2010. 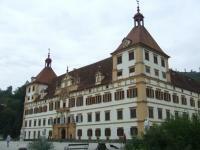 I arrived at the Eggenberg Castle around 9 in the morning. This palace lies in the outskirts of the city, easily reached by tram number 1 from the center. Although the stop is called ‘Schloss Eggenberg’, the building is not visible from that street. The area is very built up, and not in a very nice way. During the winter the main rooms of the palace are closed, so I just walked around in the gardens (which costs a 2 EUR entrance fee). It was quiet of course, the squirrels were running about doing their morning chores. And the peacocks were there too, as mentioned by John Booth. Not much more to see, although I had a quick peek into the weird mannerist grotto in the castle’s inner courtyard. Within an hour I was back on the tram, ready to explore the city center. I decided to go up to the Schlossberg first. That’s where the emblematic Clock Tower stands. I went up by elevator, which costs 1 EUR and is "just" an elevator ride. The Schlossberg area above the city is popular with locals for a stroll. That's what I did too. Unfortunately the weather was too cloudy for good photos of the city. I finished my visit by following the walking tour provided in the tourist information brochure. This will take you along the Burg’s double helix staircase, the Landeshaus were a Christmas ice crib was melting away and other minor sights. 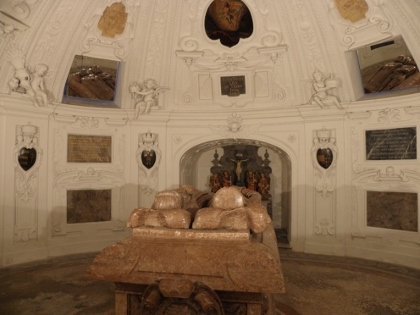 The highlight for me undoubtedly was the Mausoleum of Emperor Ferdinand II. It looks out of place here, it would suit a spot in Rome. The entrance is to the back, where behind a simple door an exuberant church and crypt awaits. P.S. : I ate once at Mangolds (see Ian Cade's review below) - tasty and cheap vegetarian food, very popular with pensioners, students and shoppers. I visited this WHS in July 2017 as part of a road trip from Vienna combining several stops along the Semmering Railway WHS. 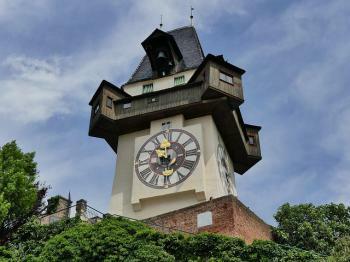 I parked my rental car in the convenient Pfauengarten Underground Garage which is half way between the heart of the historic centre of Graz and the Schlossberg with the famous clock tower. 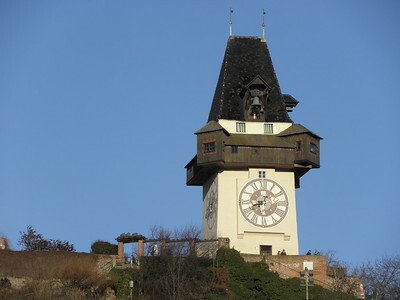 I walked up to the Schlossberg first to take in the panoramic view of the historic centre of Graz from the colourful gardens and visit the landmark of the city of Graz - the clock tower (photo). The panoramic view is not extraordinary with several modern and high rise buildings competing with the church spires and belfries. The clock tower was the highlight of my visit even though it really isn't that special compared to other clock towers in Europe. 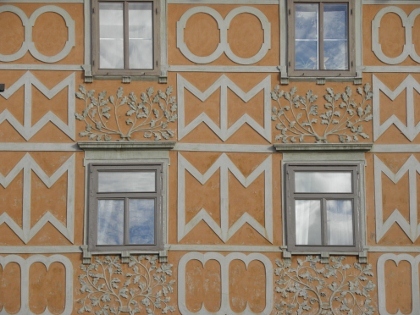 It is one of the oldest buildings in Graz and was mentioned in old documents as early as 1265. After 1560, the characteristic wooden gallery was added to the tower as well as a clock with clockworks dating from 1712. After a while, I went down the 260 stairs from the clock tower and then I walked towards Hauptstrasse and the City Hall. A marble UNESCO inscription plaque can be found at the entrance to the city hall. I also made an extra effort to visit the Eggenberg Castle and Gardens. The courtyard is worth visiting but again nothing special compared to other castles in Europe. Graz is a lively city but overall I failed to appreciate any OUV. Although close to Vienna, I'd very much recommend more time in Vienna or a trip to the Wachau Valley for the first time visitor in the area. The old town of Graz consists of beautifully preserved buildings. There are many Gothic, but especially Renaissance ones. Most of the buildings in the city center are very well preserved. Gemaltes Haus and the old university are of particular note. After three or four hours in Graz I was left feeling pretty underwhelmed, however by the time I left 24 hours later I viewed it as a city I would happily pack my bags and move to permanently. It was quite a transformation, and made me feel really happy that I decided to end my little trans-European jaunt with a night in Austria’s second city, rather than just visit for a few hours as a trip from Vienna. My initial reservations stemmed mostly from the grubby walk from the station to the city centre and the fact that as it was Sunday pretty much every shop was closed. It seemed like a pleasant enough city but nothing to get too excited about. However as I climbed up the hill things really started to get better. The wonderful double spiral staircase tucked away in the Burg really lifted my spirits. The higher up the hill I got the happier I became, it was a mix of putting in a little bit of physical effort with some nice sites and increasingly impressive modern architecture. I really enjoyed having a beer in the modernist bar atop the Schloßberg and watching the sunset over the Alpine foothills in the distance. My evening meal provided further reasons to be merry, Styrian cuisine proved to be exceptionally tasty perhaps thanks to the healthy glugs of pumpkin seed oil that are used in it, and the locals wines were very much to my liking (a personal recommendation is der Steirer, although Mangolds opposite also looked like it served up some tasty vegetarian options). 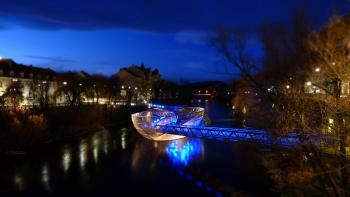 My post dinner stroll enabled me to see some of Graz's latest additions magnificently lit up at night. The Kunsthaus was flickering with LEDs, the quirky Murinsel glowed fluorescent blue, but perhaps the most impressive was the post-industrial haze surrounding the lift shaft inside the heart Schloßberg. By this stage Graz had really won me over. The next day the sun was shining and the shops were open bringing much more life to the city. I seemed to wander from highlight to highlight, having a great trip on the funicular train before nipping out to Schloß Eggenburg and seeing the new de-constructivist swimming centre. One of my favourite parts came as a real surprise to me; I popped into the K&O department store and found that it had recently been refurbished. The highlight was the great extension on the top floor that provided another wonderful café and a great roof top terrace offering delightful views of the city centre. So after my initial misgivings Graz ended up being a bit of a revelation, providing a great historic centre, magnificent contemporary architecture, excellent cuisine and even an easily reachable airport serviced by budget airlines. Graz is top of the list of European cities I would happily move to. Because there is so much to see in this city I set out early heading first for the Schlossberg for an overview. I too the lift to the Uhrturm an excellent viewpoint. I then walked up to the bell tower before decending by funicular. From there I walked to the Hauptplatz to see the decorated buildings along the Herrengasse. I particularly liked the courtyard of the Landzeughaus, but was disturbed to find portraits of Hitler and Mussolini in stained glass in the parish church. I found the trams of Graz very easy to navigate, and travelled by tram #1 to Schloss Eggenburg on the edge of the city. The palace was interesting, but the peacocks strutting around outside I found more entertaining. Back in the city centre again I enjoyed visiting the cathedral, Burg, and Mariahilferplatz as well as the food stalls in Jacominplatz. Graz is a nice historical town full of buildings from late gothic, renaissance and baroque period, that is typical for central European region. I enjoyed small restaurants located within courtyards of old houses close to main street. Nice view over the old town is from hill with the clock-tower. As Graz is located in south-east Austria, I felt an influence of "disordered" eastern Europe, but it should not be taken as disadvantage. I've been to thic city last world choir games in Graz, Austria... the place was so unforgettable and very nice.. The transportation was perfect and the community is very peaceful. Graz is a really nice city. You can walk through the inner city and see many nice buildings, many have interesting paintings on their walls (and I don't mean graffiti!). I like to visit Graz! Austria's second-largest city has a beautiful centre with lots of interesting sites (the Zeughaus has the world's largest medieval armoury), but without the hordes of tourists that crowd Vienna or Salzburg. There are buildings from several epochs, which can be seen from above from the Uhrturm (clock tower), the city's landmark. The site was recently expanded to include Eggenberg Palace, a very pretty late-Renaissance building a short tram ride from the centre. It has a large garden with an interesting archaeology museum, and is certainly a worthy addition to the site. Damaged in World War II: Despite being one of the heaviest bombed towns in Austria,the Old Town of Graz was not seriously hit as the allies concentrated on the manufacturing and railway areas BUT there was 1 significant piece of damage - The stained glass windows of the oldest church, the Stadtpfarrkirche, "were destroyed.... The new windows, designed by Albert Birkle from Salzburg caused controversy as they showed Hitler and Mussolini among the torturers of Jesus." Built in the 15th century: For its Gothic buildings: ". Of the original castle where Emperor Frederick III resided, all that remains is a Gothic hall, a late Gothic chapel, and a double spiral staircase going back to 1499. .... Frederick III built the present cathedral in late Gothic style (1438-64)"
Developed since inscription: The Kunsthaus and the Murinsel were built 4 years after inscription. 220 Community Members have visited.